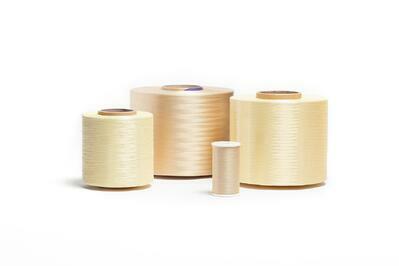 Some of the higher priced industrial yarns and threads available are made from Dupont™ Kevlar® fiber. As the pioneer aramid fiber, DuPont™ Kevlar® is specified for some product applications with a long qualification process, however, some industrial applications can benefit by looking at alternative aramid yarns and threads. So general properties of the other Aramid fiber options are quite similar to Kevlar®. Generally speaking, any of the Aramid yarns listed above can be used to manufacture similar sewing threads that will meet and exceed Mil-Spec A-A-55220 (formerly MIL-T-87128). These fibers can also be used as replacements to Kevlar® to achieve the similar results in other applications, including rip cords for wire and cable, reinforcement yarns in hose manufacturing and other specialty applications.